Rants and Raves / Are You Really Running on That Treadmill? Are You Really Running on That Treadmill? Get out and go for a run! I have often been heard to remark that indoor cardio (with machines like treadmills or stationary bikes) is, at best, a mixed blessing. On the one hand, it is nice to be able to know exactly how fast of a pace you are keeping. And it’s nice to be able to adjust your intensity with the push of a button. Treadmills can also be beneficial when doing interval running and/or sprints. But my big gripe is with people who consider themselves “runners” but have never actually run outdoors. Anyone who has a considerable amount of mileage under their belt on both treadmills and actual terrain already knows that they are quite different experiences. When you’re on a treadmill, the conveyor belt moves towards you and you stay in the same place. All you do is lift your foot. You don’t actually propel yourself forward. All this probably sounds obvious, but bear in mind that this phenomenon makes it considerably less work, and it can give you a false sense of how fast you are. You might be setting yourself up for a rude awakening when you actually start running for real. It is so much more challenging–and of course, the greater the challenge, the greater the reward! Now don’t get me wrong, I’m not trying to sound like an elitist here. Treadmills are great for all the reasons I mentioned above. But it’s easy to rely on them too much. They are designed to supplement actual running–not replace it. The majority of your training should be done on real terrain. If you only run on the treadmill, you are missing out on one of the greatest joys that I’ve known in life. The recent boom in popularity of outdoor running is undeniable. 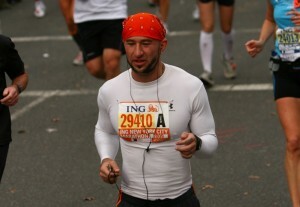 This past November, over 42 thousand people completed the NYC marathon (including me)–the most finishers ever! So think about it, are you really running on that treadmill? Haha–just fixed it. I don't know how that slipped by me! Yeah there were an awful lot of people. Btw, congrats on finishing! That's a very good point about the timer on the treadmill. If you aren't sweating, you definitely aren't running! Spot on!!! Always ask yourself why am I doing this, what is the benefit or purpose of this exercise. It doesn't matter that running on treadmills or outside as long as you are serious on workout. I'm guessing you didn't even read the post. I'm going to leave your comment up even though it's spam because I think it's funny. Must agree on the treadmill. One of the best trainers I know told me you have to put a 1.5 incline on a treadmill to approximate a flat, level track, and that sounds about right…but it still isn't the same. Same with nuatilus/ cybex etc. vs real weights, just not the same. My moto, train real to be real. plus the heart rate monitors are wacky, and no one at my gym tightens the belts. This article starts out mentioning both treadmills and stationary bikes are mixed blessings. And you give a good explanation about what is wrong with treadmills: that you really aren’t projecting yourself forward. But what is wrong with stationary bikes? Even on a real bike there is an indirect linkage between pushing pedals and you going forward. Sure you won’t ever have to pedal up hill and overcome gravity but the exercise bikes provide resistance with clamps that pinch the wheel. Hey Nyall, my issue with stationary bikes is the same as my problem with treadmills – they are not a very accurate simulation of the real thing. Like you said, pushing through resistance provided by a clamp is not the same as overcoming gravity. Plus, you don’t have to deal with balance, wind, etc. on a stationary bike. In my opinion, it is not adequate preparation for an actual ride (or as much fun!). Stationary bikes can be a nice way to supplement actual riding, they can never replace the real thing. Just found your site today while searching for ways to work up to doing a pull up and I’m loving it, very inspiring. I’m excited to try Australian pull ups during my workout tomorrow! Just wanted to throw in my 2 cents on treadmills…I love the outdoors and I agree that is the best place to run. I try to train on a treadmill once a week to work on building speed. I also walk fast at maximum incline as a warm up on my strength training days, it gets my heart rate up and strengthens my legs. I have noticed an improvement on my outdoor runs since I have been training this way on the treadmill. Thanks for all the great information. I will be starting week 5 of a pushup program at hundredpushups.com tomorrow. I’m female and am working hard at gaining upper body strength, the program works…I could only do 15 consecutive pushups when I started and I can now do 30! It will take me longer than 6 weeks to make it to 100 consecutive…but that is the goal and I will get there! Hey Amanda, glad you’re enjoying my blog – thanks for stopping by! Treadmills can be helpful as a supplement to outdoor running, but they can never replace the real deal. Keep training hard and good luck with your push-ups!